OpenPTrack V2 (Gnocchi) introduces a new 3D pose tracking and pose recognition feature. Each sensor within the field provides three types of data: color (RGB) images, depth images, and some calibration parameters. This information is enough to build 3D point clouds, the core data OPT uses. The data flow coming from each sensor is intercepted by a skeleton detector (orange box in the picture above), with the goal of understanding the skeletons’ locations by considering their color images. 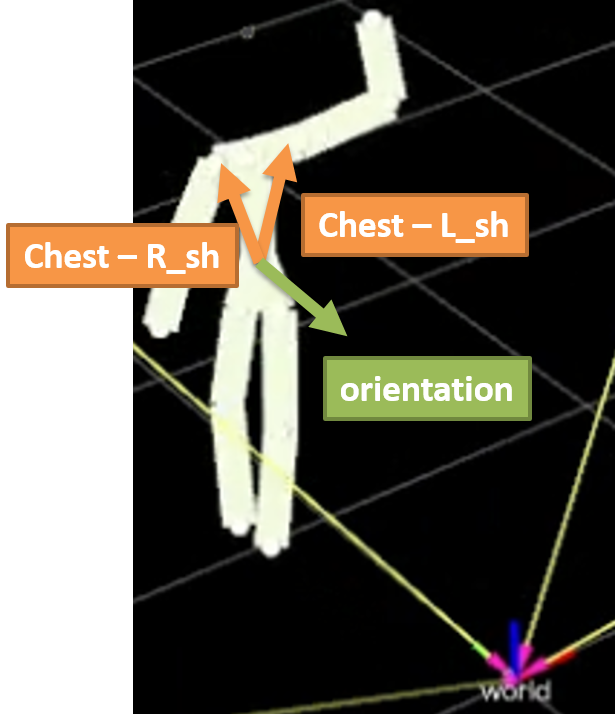 The library being used to compute this information is OpenPose, an open source multi-body pose estimation algorithm. Once the skeletons are located, they can be drawn onto each image. However, since we also have 3D data, the point cloud information and just-computed 2D skeletons are combined, projecting them in the 3D world. The single-view detector takes the color, depth and geometric properties of a sensor as input, and returns the set of 3D skeletons as output. They belong to people who were already in the tracking space, and the system should update the positions with the new data. The system should be able to detect whether a skeleton which was in the space has no new data, i.e. the person left the tracking space. In this case, its track should be removed. The math behind this computation is called the “Hungarian algorithm”. We’re not going into detail here, but if you are a curious nerd like us, please check out our paper. The 3D poses are also sent via UDP in a comfy JSON format, ready to be read and used by any third-party application. Check the wiki to learn more! Real-time poses are helpful in building rich Human Computer Interaction systems, but recognizing poses as well is even better. To this end, OpenPTrack embeds a pose recognition algorithm which is independent from the shape and size of a person, since it is based on the position of arms and legs. Since we are still in a calibrated camera network, and the data always refers to a common world reference system, it is possible to compute a displacement angle between the heading direction and the xOy plane of the world (i.e., the ground plane). Given this angle and the fact that we are addicted to mathematical trickery as roto-translational matrices, we can roto-translate the joints of each skeleton in the scene and place them at the origin. At the same time, we can perform another important transformation: Each link is standardized to a unit length. In this way, the frontal standard pose of children, kids and adults are all directly comparable; heights and shape of bodies do not matter. Pose recognition is performed by means of the calculation of a distance between the current standard pose and a set of template galleries. A template is simply a pose with a tag name to be recognized. OpenPTrack allows registering an unlimited number of templates. (Take a look at the wiki on how to do this). Recording a new pose to be recognized is not difficult and is totally body driven! A person can even act as a model to record another person. 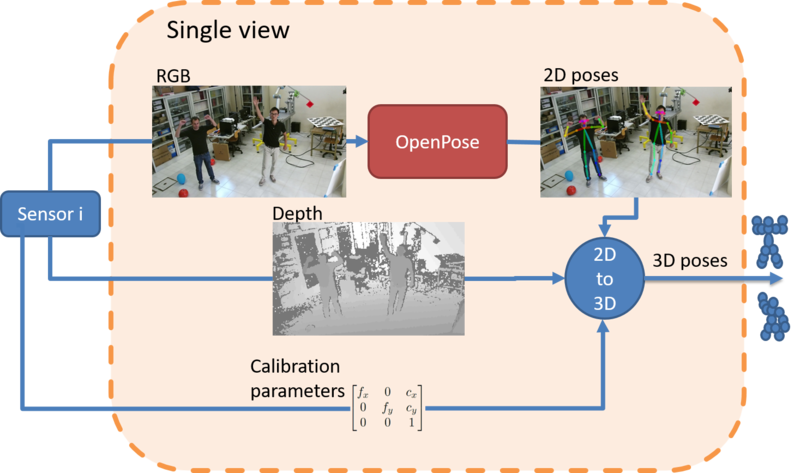 If you want to know more about the pose recognition module, please check out our paper.